Dandavats | Srila Prabhupada: Simply Love Krishna! Krsna is full with six kinds of opulences. So this is the opulence of Krsna’s beauty. Krsna wants everyone…we are offering obeisances to Krsna with awe and veneration. But nobody comes here to Krsna with a rope: “Krsna, You are an offender. I shall bind You.” Nobody comes. That is another one of the prerogatives of the most perfect devotee. Yes. Krsna wants that. This privilege is especially given to Yasodamayi, because she’s such an advanced devotee that she has got the right to chastise the Supreme Personality of Godhead. That is special prerogative. Who is not afraid of Krsna? Everyone. But Krsna is afraid of Yasodamayi. This is the superexcellence of Krsna. Just like another name of Krsna is Madana-mohana. Madana means Cupid. Cupid enchants everyone. And Krsna enchants Cupid. He’s so beautiful that even Cupid is enchanted by Him. But again, on the other side, Krsna, although He’s so beautiful that He enchants the Cupid, still He is enchanted by Srimati Radharani. Therefore Srimati Radharani’s name is Madana-mohana-mohini. Krsna is the enchanter of Cupid, and Radharani is the enchanter of that enchanter. So these are very high-grade spiritual understandings in Krsna consciousness. It is not fiction or imagination, concoction. They are facts. They are facts. And every devotee can have such privileges if he is actually advanced. If you love Krsna as your child, then you’ll have such privilege. When, as soon as Krsna saw Mother Yasoda is coming with a rope to bind Him, He immediately became very much afraid so that tears came out: “Oh, Mother is coming to bind Me.”And the ointment is being washed off. And with great respect, looking to the mother, with feeling appeal: “Yes, Mother, I have offended you. Kindly excuse Me.” This was the scene of Krsna. And immediately His head came downward. So this is another one of Krsna’s perfections. In Bhagavad-gita (7.7) He says, mattah parataram nanyat kincid asti dhananjaya: “My dear Arjuna, there is no superior being above Me. I am the supermost.” Mattah parataram na anyat: “There is nobody else.” That Supreme Personality of Godhead, above whom there is none, that Supreme Personality of Godhead is bowing down before Mother Yasoda. He is accepting, “My dear Mother, yes, I am an offender”, with a feeling of fearfulness. So that is the scene appreciated by pure devotees – that how much greatness is there in the Supreme Person that He is playing exactly a perfect child. When He was playing like a child, He played perfectly. When He played a husband, with 16,000 wives, He was playing perfectly as husband. When He was playing as lover of the gopis, He was playing perfectly. When He was friend of the cowherd boys, He was playing perfectly. Every day, all the boys, they would come back to their home and explain to their mother, “Mother, Krsna is so wonderful. You see? This happened today.” And the mother would say, “Yes, our Krsna is wonderful.” So much. That’s all. They do not know Krsna is God, Krsna is the Supreme Person. “Krsna is wonderful”, that’s all. And their love increases. The more they perceive Krsna’s wonderful activities, the more they love Him. When Nanda Maharaja would talk amongst his friends and the friends would talk about Krsna, “Oh, Nanda Maharaja, your child Krsna is wonderful.” “Yes, I see that.” “Maybe He is some demigod.” That’s all. “Maybe.” That is also not certain. So the inhabitants of Vrndavana, they do not care who is God, who is not God. That is not their business. But they want Krsna and love Krsna. That’s all. Those who are first of all thinking of analyzing Krsna, whether He’s God, they are not first-class devotees. Those who have got spontaneous love for Krsna, they are first-class devotee. How will you analyze Krsna? He’s unlimited. It is impossible. We should not try to analyze, to know Krsna. It is impossible. We have got limited perception, limited potency of our senses. How can we study Krsna? It is not possible at all. Whatever Krsna reveals Himself, that much is sufficient. Don’t try it. This Vrndavana status of mind is the perfection for the devotees. They have no business to understand Krsna. They want to love Krsna, without condition. “Because Krsna is God, therefore I love,” – their mentality is not like that. Krsna is not displaying Himself as God in Vrndavana. He is playing there as an ordinary cowherd boy. But at times, He’s proving that He is the Supreme Personality of Godhead. But they do not care to know it. The outside devotees, the devotees who are outside Vrndavana, they are studying the inhabitants of the Vrndavana, how great they are. But the inhabitants of Vrndavana, they don’t care to know how great Krsna is. That is the difference. So our business is simply to love Krsna. The more you love Krsna, the more you become perfect. It is not that it is necessary to understand Krsna, how He has created. Krsna explains these things Himself in the Bhagavad-gita – that much. But don’t bother very much to know Krsna. That is not possible. Simply increase your unalloyed love for Krsna. That is the perfection of life. Thank you very much. 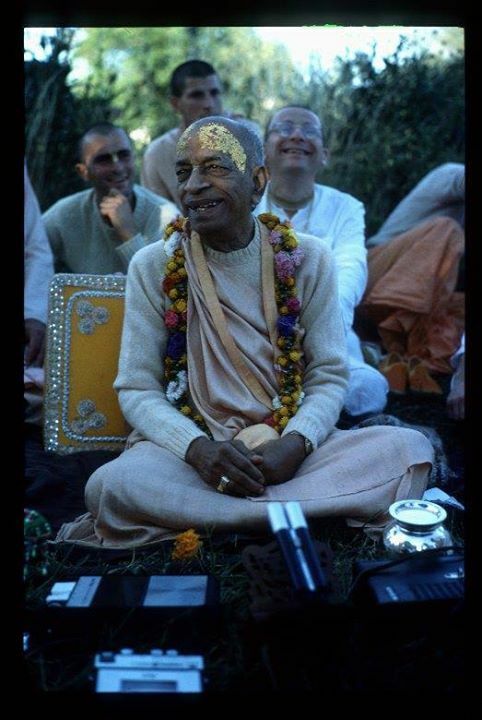 [lecture ends] Excerpt from a lecture by Srila Prabhupada in Los Angeles, April 23, 1973.